Over the years we have had the opportunity on two different occasions to visit and investigate the St Augustine Light House. The first visit was many years ago and we had little equipment to work with, and therefore caught no evidence. A few years later we sent a different team to the location when they were vacationing in the area. They had better luck at capturing some evidence. As we mentioned earlier, our time and resources were limited when DAPS was first formed. Most of our investigations were abandoned buildings in our parents home towns. Our only equipment at the time we investigated the St Augustine Lighthouse in early 2007 was a digital voice recorder, a mini-DVD recorder, and two digital cameras. We looked into getting an IR camera, but the cost was prohibitive at the time. This investigation was our first big investigation. So far we've done three big investigations at three locations while we were on vacation that spring (2007). Its a slow start, but its a start! Our very first big investigation was inspired by Ghost Hunters. Having lived in Florida for a number of years, this was a great place to start as I knew where to go, and how to get around in the area. We visited late in the evening just before closing time and had the place pretty much to ourselves. It was a HOT day, and the temperatures in the tower were stifling. Its a long way to the top, and the echo's played havoc with the recordings. Along the way we were able to investigate the oil bucket. Its quite heavy and I cannot see how it dropping sounded anything like the window closing as the window clearly had a glassy sound to it where the bucket was a solid heavy bang. We were not able to gain access to the area where the actual light was located, and it would have been interesting to see what it looked like in there. We witnessed the motion detector at the top and stood where the full body apparition stood and looked down at the TAPS team. This is shown above in the photo. We did a little EVP work while in the tower, but were not able to capture anything significant. We filled one digital camera with shots hoping to see a shadow appear in one, but again we came up empty. Next we visited the keepers quarters. We were not able to gain access to the former sleeping area in the main keepers building, but were able to move freely on the first floor and in the basement. We took numerous digital photos, and did more EVP work, but sadly we came up with nothing yet again outside of some noises. We both kept hearing a strange low hum like sound coming from the cisterns, but the digital recorder did not pick them up, and the digital photos came up with nothing unusual as seen in the photo below. With this being our very first big experience ever as a professional paranormal group, we were a little disappointed that we did not have any personal experiences, and were not able to capture any hard evidence of any paranormal activity at the St Augustine Light House. Based on those facts, we must conclude at this time that whether the St Augustine Lighthouse is haunted or not, is inconclusive. We sent Brian and Jennifer back to the St Augustine Lighthouse in Florida when they went on a vacation to the state recently. We were interested in seeing if they had better luck than Kim and I did on our investigation a year or two earlier. Their biggest difficulty, and this is one of our biggest problems, is getting owners/managers to give the investigators permission to go into places alone and do their investigations. Here are their findings. Brian and Jennifer spent several hours covering the guest house, keepers house, and lighthouse tower as well as doing some investigating on the nearby grounds. They were unsuccessful in capturing any EVP's on the Digital Voice Recorder, and nothing showed itself on the mini-DVD. They did however capture a few interesting things with the digital camera. The first photo shown below appears to show a nice Orb at the base of the tower. We cannot see anything that a camera flash would have reflected off of, it does not seem to be a bug, and we believe that its too large to be a dust particle. I'm not a firm believer in Orb's, as far too many times they are nothing more than dust or insects, but we'll post this for those who do believe Orb's are more than that because this one we cannot easily debunk. The next series of photographs were taken by Brian outside the tower on the grounds. He usually sets the camera to take photos in series, this avoids the longer delay between photographs while the camera saves and resets. As you can see from the photographs, there is nothing there in the first photo, then a mist appears in the second photo, and by the time the third photo is taken its already gone. I'm not 100% sure how fast the camera is taking the photos, but its very quickly in succession which makes this series very interesting indeed! As you can see, Brian does not move while the photos are run off by evidence of the phone pole to the left of the shot. Brian and Jennifer reported a few personal experiences while conducting the investigation. 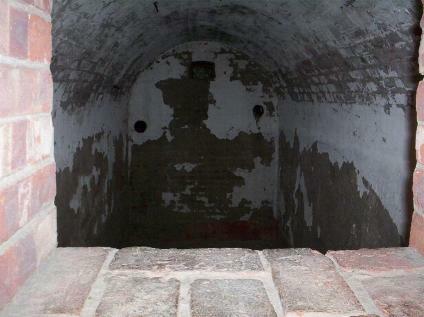 While they were in the upper part of the main tower and while they were in the basement of the keepers house they had the feeling of being watched. Being in Florida where its warm even at night, cold spots are very noticeable. They claim to have felt that the basement area near the cisterns seemed a bit cooler than other areas of the basement. This could however be attributed to the cisterns being cooler and that air making its way out into the corridor there. Overall, the investigation went well, and we were finally able to get some real evidence to post to the web page. Our next investigation will be at Fort Delaware where all four of us will hunt for the spirits that are supposed to haunt that place. 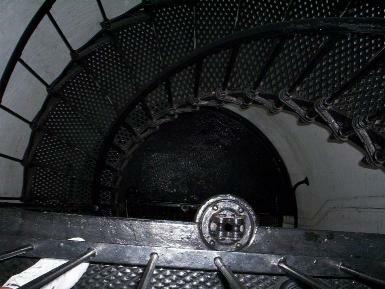 Based on the experiences encountered by the investigators, and the evidence captured, we would conclude that there is some sort of Paranormal activity at the St Augustine Lighthouse.